Something for the young, and the young at heart. 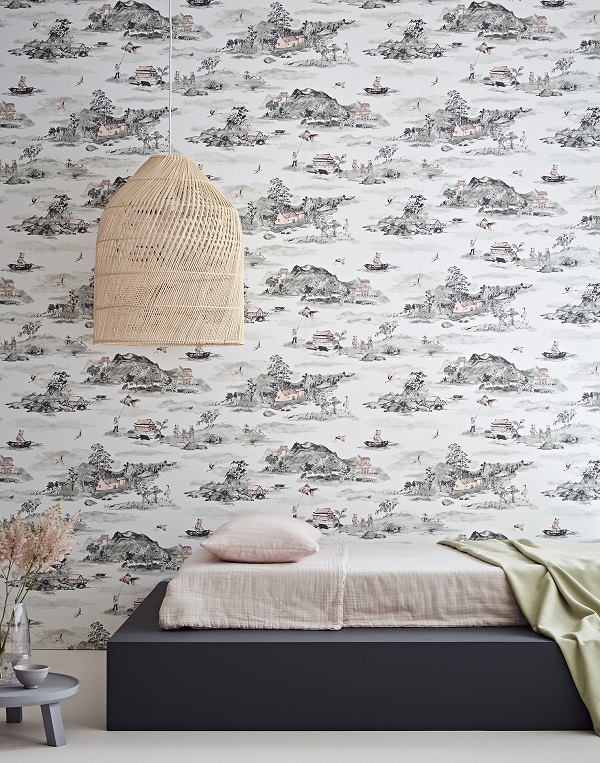 Sian Zeng has just launched a new range of magnetic wallpaper collection which merges Chinese painting and European illustrative styles. The result of which is a spectacular landscape of misty mountains and time-honoured Chinese houses - the perfect homes to bears looking for their next adventure. It's a long awaited sequel to the Sian Zeng Dinosaurs collection of magnetic papers which offered kids a magical trip to a far off land, and the perfect backdrop to young next adventures. The magnetic Mountains wallpaper tells the tale of a brave young bear helping a semi-star to find its missing half. Amidst mist-covered mountains, hidden pagodas and wide oceans, the little bear must find his way. Designed to stimulate storytelling and imaginative play, a cast of magnetic characters – including bears, a boat and fish – are available separately, so children (and adults!) can act out their own stories. Also available as a classic wallpaper in tones of grey and pink or dusky blue and peach.